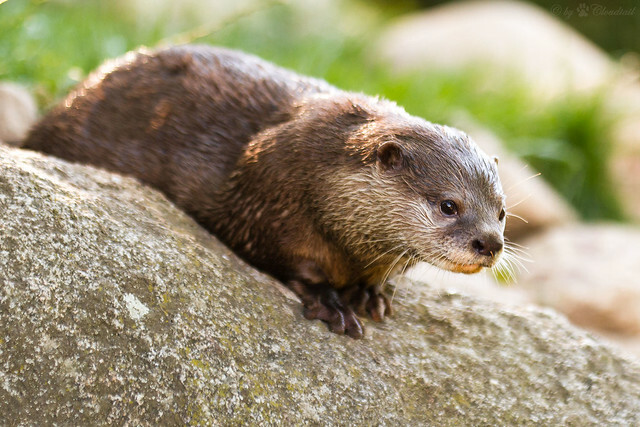 Today’s open thread is hosted by an otter spotted at Zoo Karlsruhe. This photo was shared by Cloudtail on flickr. According to our family’s fridge whiteboard weekly planner, today Sprog the Younger will be Taking Over The World. Oh good. If it is after 2pm I will be at the circus (not an euphemism). Can we make requests or should we just commence quivering in our boots? She has not yet shared any details of her plans with me, Mindy. I’m getting some extra ice cream in, just in case she needs appeasement of some sort. tigtog: My whiteboard shopping/to-do list says “Buy [the Lad] Lots and Lots of Lego.” You might want to pass that on to your Sprog, since she’ll be in charge from now on. My fridge whiteboard just says “Chocolate custard” I don’t think my lot are trying hard enough. Circus was teh awsum. I think my favourite bit was the matching father and daughter outfits in pink with green sparkles. Amazingly talented 7 year old who was born to parents in the circus biz and it shows. Then an adorable 4 yr old (different parents, but still circus parents) came out and did a little routine as well. Grumpy lions, performing dogs, acrobats, people flying through the air, my inner 5 year old is very happy. Doctor Who Christmas Special preview trailer, anyone? Today the horror I’m feeling over the deaths in Gaza is making it difficult to think about much else. Like a lot of folks, I’m reluctant to talk about it in case I’m accused of being pro-Hamas. Ooh, Doctor Who trailer! Snowmen = freaky, Vastra = awesome. Why is Moffat obsessed with the whole mother-children-bedtime-story thing though? Is it getting a bit old for anyone else too? Have successfully gone a week without Facebook, after I got really upset about some things. Turns out, I don’t even miss it much. So that’s one thing that will be taking up a lot less of my future time. Am definitely old. Response to “fake geek girl” controversy recently was ‘Yawn’. My female geek friends and I used to discuss this, back in the 90s. In the context of fantasy role playing game illustrations, but it’s the same issues as with comics, I think. We decided that part of the problem is that pretty much any woman between 15 and 30 (and many older than that) can wear some costume that conveys “oversexualised female fantasy illustration” but a lot of men, and particularly men with stereotypical geek physiques (either very thin or fat) can’t dress up to be a convincing Conan or similar muscular fighting type. And despite the variety of characters available to play in these games, the muscular fighter is a particular ideal in fantasy illustrations (and comics). So I think that underneath it all, there’s a level of resentment that women can even pretend to approach the illustration ideal (that phrase, “con hot”, reeks of it) and many (geek) men can’t. The funny thing was, while we girls could (and did) dress up, we had a lot of ironic awareness (see above discussions) while a lot of the resentful boys didn’t seem to have grown out of the wish-fulfilment phase. And since this comment is long already, it reminds me of Lego’s claims around their recent “friends” line for girls, that girls want to identify with the minifigs, boys not so much. I wonder if this is a stage girls go through younger, pre-puberty (friends is for 5-8) and boys only really get into in their teens. At least that seemed to be true for the geek boys around me at the time. Eclipse done and dusted! I still need to write it up somewhere, time is getting away from me. I’m having surgery next week and stressing a bit. The vulnerability involved in general anesthesia gets me every time Hopefully I can give a good account of myself on the Otterday thread December 1! Yes, good luck with your surgery, Mary! I’m glad to hear that it’s finally going ahead. I think it’s half true? Not everyone on Androcur gets on registry, just to get Androcur on the PBS (much cheaper than full price) sexual offence risk is one of the only reasons it’s covered. Androcur is covered on PBS for intersex people if medicare deems them to be female, because “severely androgenised female” counts. But to be legally female in Australia a transwoman has to be post-op, and thus she wouldn’t need Androcur, so transwomen who need it can’t get it on the PBS. I think theoretically if they paid full price transwomen could get it on the PBS. I know at least one person who’s been offered the option of going on registry to get Androcur on PBS, she decided to stick with spiro’. Also, getting it on a false diagnosis would technically be fraudulent, so the effect of being on the registry is not the only problem. You could get it as androgenised female if you were able to get them to change records, but that would only save $5, you’re better getting it full price. Why are she and Jenny Flynt not a spinoff? They should be a spinoff.